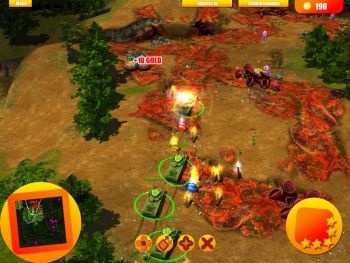 After a brief delay caused by "last-minute issues with the game," Stalin vs. Martians, the odd little RTS that pits the Red Army against the Red Planet, is now set for release on April 29. The game was originally slated for release on April 20 but was held up by unspecified issues, although Mezmer Games Executive Producer Tom SÃ¶derlund attempted to shift the blame to the infamous Soviet strongman himself. "A dictator is never late, nor is he early," SÃ¶derlund said. "He arrives precisely when he means to." Stalin vs. Martians will normally retail at at $19.95 but gamers who place a preorder before the launch date will receive a 20 percent discount. The game is currently available exclusively via digital distribution on Steam, GamersGate, Direct2Drive and Impulse. The game will offer roughly six hours of gameplay for people who rush through it, although SÃ¶derlund added that most players will need a little more time than that. "Stalin vs. Martians is not the longest RTS ever made," he said, "but the memories will haunt you a long time after." "The game is ready for deployment!" SÃ¶derlund continued. "Fans of historically inaccurate World War II games everywhere will rejoice." More information about the "not-so-epic RTS" is available at Mezmer Games or stalinvsmartians.com.